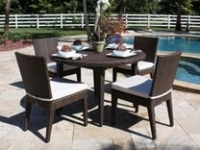 Our Wicker Dining Sets and Furniture Pieces come in dozens of colors, weaves, and styles. Our dining furniture is guaranteed to withstand the elements for use both indoors and out. Purchase a complete matching set or combine dining tables and chairs to create your own custom dining set! We are an authorized dealer of a variety of brands such as Forever Patio Wicker, NorthCape International, Hospitality Rattan, South Sea Rattan & Wicker Furniture, Tortuga Outdoor, Source Outdoor Furniture, Lloyd Flanders, and Panama Jack. 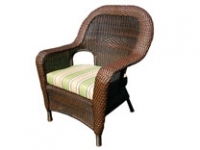 Our outdoor wicker dining furniture combines the best in quality outdoor furniture at an exceptional value. 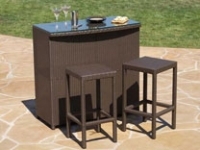 So if you are in the market for the perfect patio set for your rest and relaxation or for entertaining your guests, then come take a look at our wide selection of wicker dining sets, pub, bistro, and bar patio wicker.